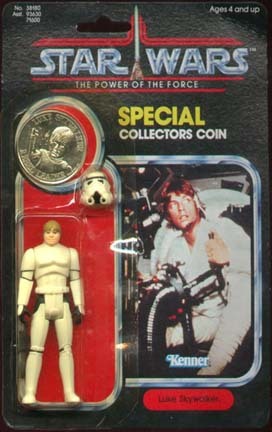 This is a Luke Skywalker in Stormtrooper Disguise carded sample mounted on an unproduced Luke Gunner POTF proof. The exact nature of it's use is still not completely clear but Chris suspects that it may be some kind of piece used to test the attachment of the Luke Trooper bubble. The bubble is production quality, but hand cut, and if you look closely you can see that the flange on the right side extends much further than that which was used on the final production piece. Whatever it was used for this is one cool sample. Not only is this one of the more sought after loose figures but it is on an unproduced cardback of the same major character.